Hilton Quality Assurance - Outstanding! Trip Advisor - Certificate of Excellence 2015, 2016, 2017 Booking.com - Fabulous 4.4 out of 5 Expedia - 4.5/5 Wonderful! A local favorite, Tigin Irish Pub is a popular nightlife destination. Party packages are available. The Gateway Arch is like no other attraction, so before you visit, you may want to explore our extensive site, which includes a listing of interesting things to do and see, instructions for getting to the top of the Gateway Arch, and some fascinating facts about the Gateway Arch. Things to Do: Learn about the attractions and events the Gateway Arch and the city of St. Louis has to offer. Getting to the Top: Get all the information you need to make your trip to the top of the Gateway Arch a breeze. Gateway Arch Facts: Discover how the GatewayArch was constructed, and learn other details about the largest manmade monument in the United States. Fun Stuff: Have a good time while learning some interesting facts about the Gateway Arch. Busch Stadium home of the 2006 World Series Champions the St. Louis Cardinals. The old and the new are merging in the Laclede’s Landing entertainment district. The Landing, as the locals call it, is a colorful snapshot of old St. Louis with cobblestone streets and historic 19th-century riverfront warehouses converted into nightclubs, restaurants and offices. There are two casinos in the entertainment district – the President Casino along the historic riverfront, and the sparkling new Lumière Place casino complex. The district is named for Pierre Laclede, St. Louis’ French founder. Once the hub of river trade, today this is the place to take a carriage ride on a sultry summer night, dine with friends and linger in the clubs to hear St. Louis’ music in its original context along the Mississippi. Take a dinner cruise or an hour-long narrated sightseeing journey on the Gateway Arch Riverboats paddlewheelers, visit a brewpub or see the nation’s longest-running dinner theatre – The Royal Dumpe – during a visit to The Landing. The Riverfront Trail bike path passes through the Landing’s streets on its way up the river. On Labor Day weekend, the district host the free Big Muddy Blues Festival. You can take one-hour narrated trips and specialty cruises on the Gateway Arch Riverboats paddlewheelers or see the nation’s longest-running dinner theatre – The Royal Dumpe – during a visit to The Landing. The Riverfront Trail bike path passes through the Landing’s streets on its way up the river. In June the district hosts a rock ‘n’ roll music event and each Labor Day weekend the Landing is home to the Big Muddy Blues Festival. Both are free events. The $280 million facility opened on November 12, 1995, the building has hosted major conventions, elaborate trade shows and exhibitions and touring entertainment acts as varied as rock concerts, motocross races and monster truck rallies. And, in combination with the five other America's Center exhibit halls, the Dome has hosted a Mass celebrated by Pope John Paul II, which was the largest indoor gathering ever held in the U.S. The facility has also played host to numerous amateur and professional sporting events.. Located in the heart of downtown St. Louis. Featuring 190 guestrooms with spectacular views of the Gateway Arch, the St. Louis riverfront, and the Dome at America's Center. All 190 rooms feature Hampton's Clean & Fresh Bed, 42” HDTVs, Herman Miller Ergonomic Desk Chairs, and complimentary internet access. The hotel has 5,000 square feet of flexible meeting space, accommodating between 8 and 200 attendees. Complimentary Business Center available 24 hours. Complimentary internet access throughout the hotel, public areas, meeting rooms, and guestrooms. Free Hot Breakfast. Valet laundry service and guest coin laundry. Lobby Treats shop. Tigín Irish Pub & Restaurant on site. A large heated indoor pool with panoramic views of the Gateway Arch & Mississippi Riverfront. 24 hour complimentary Fitness Center & Game Room. Nearby recreational activities include jogging and biking trails, walk to many restaurants and nightlife. Enjoy St. Louis attractions such as the Gateway Arch, Busch Stadium, Anheuser Busch Brewery, The Dome at America's Center, walk to the Convention Center, Laclede’s Landing, Forest Park, St Louis Zoo, and Lafayette Square. 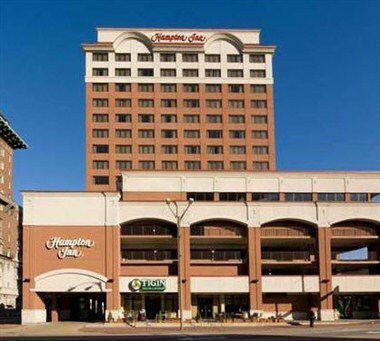 Meeting Facilities: The Hampton Inn-Gateway Arch has approximately 5,000 square feet of flexible meeting space, including 4 function rooms; one being our 2,625 square foot Lewis & Clark Ballroom which has a dividing air wall. Our meeting rooms can accommodate from 8 to 200 guests in a variety of styles.